We set off to Coventry this morning so that Tom could visit the Electric Railway Museum which was opening it's doors for the last time this weekend. The yard was filled with lots of rusty old trains, which all meant a lot more to Tom than me, but we had fun exploring the ones you could step inside. One of the things Tom was most excited about was an old signalling station from Brixton which has been set up in one of the carriages. There was a prototype for a tilting train from the 70s, which could lean into corners and make the train go faster, but it made the passengers feel ill so it never took off. And if the trains weren't enough to make Tom happy, they also had a little brewery with beer and cider for sale. We got a bottle of of the museum's home brew Third R-ale to take home. There's a diner on a plane at Coventry Airport called DC-6 Diner. They had stopped serving lunch by the time we arrived, so we'll just have to come back next time. We then headed to Bournville, just outside Birmingham to visit Cadbury World. We had arrived just in time to take the last tour, so we got our tickets and headed in. The tour began in the Ghana rainforests where cocoa beans were grown. There was a 4D theatre where we got to experience what it felt like for cocoa beans to be sorted and roasted, as they're turned into chocolate. We then made our way through Victorian London streets where White's hot chocolate house was opened. There was a recreation of the original Cadbury's storefront. One awesome tacking they kept using throughout the tour was to hand us lots of bars of chocolate and it definitely worked well on us. 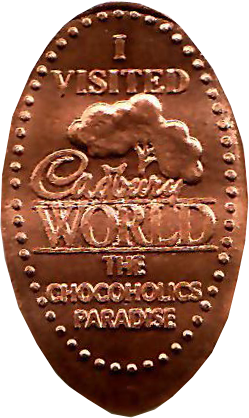 We then boarded a little ride which was like It's A Small World but with cocoa beans. You used to be able to see chocolate being made in the factory but that area had been shut down. Instead, they bribed us with more chocolate tasting. We headed to the shop afterwards to get some squished pennies and buy a bag of Misshapes. We headed into Birmingham afterwards to find something to eat, and just after parking up, some fashion bloggers started posing with Figgy. We went for dinner at Nosh + Quaff which was in a super pretty building. We ordered some cornbread and lobster cakes to start, before tucking into veggie burgers. I had the mac n cheese burger which was massive and tasted just as good hot as the second half did for lunch the next morning. Afterwards we headed to Tilt, a pinball arcade and craft beer bar. The Elvira machine was my favourite and after several games, it was time to head back to London.